I wanted to create a video of a technical architecture presentation. 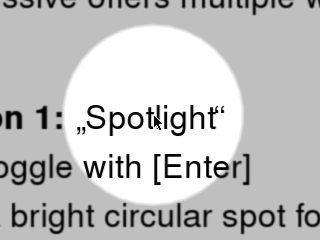 It was created in Visio, but I really wanted to capture Mac-style mouse motions and spotlight effects as I narrated. After a number of blind allies around mouse display software, I happened upon Impressive, an open source program that runs against PDF files. Upon reading the Technology paragraph, which mentioned Python, GhostScript and OpenGL, I assumed that I would pay a brief visit to the downloads page, read some phrase about compiling from the C source code, and then move on. How wrong was I? You download the Windows package, unzip it, and you’re good! Impressive runs from PDF files, so you need to convert your Visio or PowerPoint slide into PDF before you can launch it. Then, you either launch it from from the command line, or create yourself a Windows Shortcut to impressive.exe, and place it in the C:\Documents and Settings\[USERNAME]\SendTo folder. Then you can right mouse click on the PDF file and choose ‘Send To > Impressive’ to start the show. C:\Apps\Impressive\impressive.exe -g 1440x1080 -f "MySlides.pdf"
And the best thing? Impressive is (effectively) a portable application, so you can use it in a locked down environment. This entry was posted in DOS Shell, Mac, Open Source, Portable Applications and tagged impressive, portable application, presentations, spotlight by ben.dalby. Bookmark the permalink.